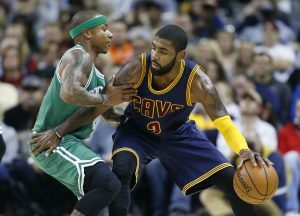 Cleveland Cavaliers guard Kyrie Irving, right, looks to drive against Boston's Isaiah Thomas during the first half of a 2016 game in Cleveland. Irving, who asked Cavaliers owner Dan Gilbert to trade him earlier this summer, could be on his way to Boston as the Cavaliers are in serious negotiations with the Celtics about swapping him for point guard Thomas. Cleveland Cavaliers guard Kyrie Irving, right, looks to drive against Boston’s Isaiah Thomas during the first half of a 2016 game in Cleveland. Irving, who asked Cavaliers owner Dan Gilbert to trade him earlier this summer, could be on his way to Boston as the Cavaliers are in serious negotiations with the Celtics about swapping him for point guard Thomas.